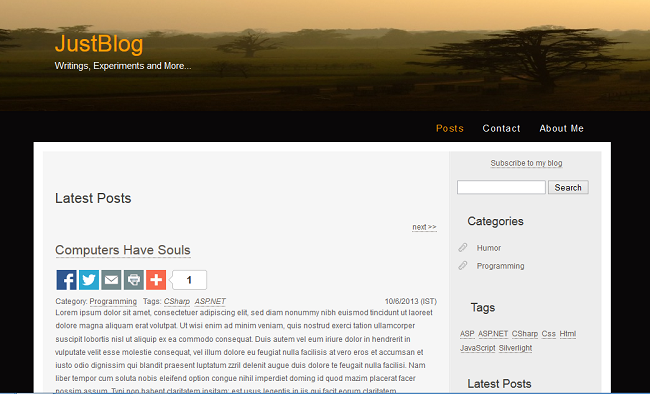 JustBlog is an open-source blog application built using ASP.NET MVC. It brings you the following exciting features. I haven't decided the license type that I should apply for the source code in GitHub. You are allowed to copy, modify and use the source code to build your own blog. But, you are not allowed to sell any product that is built using the original or modified source code. If you have already bought a domain it's fine else you can buy using GoDaddy or any other domain service provider out there. Having just a domain is not enough, you've to decide where you are going to host it. There are lot of hosting providers available. Before choosing the hosting provider make sure they support windows hosting plan with .NET framework 4.5 and ASP.NET MVC 4. Also make sure they provide support for SQL Server 2010 or 2012. If you have the domain and hosting ready, you can launch your own blog in just 8 steps!